The improved Ford Tourneo Connect is a clever and well-engineered van-based people mover that's offered in normal five-seat or long-wheelbase seven-seat Grand Tourneo Connect guises and these days gets the frugality of Ford's latest 1.5 TDCi EcoBlue diesel engine. If you like the idea of a rugged, tough commercial-sourced MPV but want a few creature comforts at the same time, here's the perfect compromise. Think people mover vehicles and you'll probably think of cars like the Ford C-MAX, the Renault Scenic and the Vauxhall Zafira. Increasingly though, customers looking for true practicality are often finding models like these a little too polished or, to put it bluntly, not something that you'd be willing to pile a wet dog into. It never used to be that way. The first generation of these cars were resolutely practical things. Today, while they still retain the space and the clever folding seats, the ambience is one of club class travel rather than rugged practicality. That's where cars like the Ford Tourneo Connect come in. A gap opens beneath these increasingly glitzy MPVs for something a bit more blue-collar, something that doesn't mind rolling up its sleeves once in a while. This genre of car was popularised by models like the Citroen Berlingo Multispace and the Peugeot Partner Combi. Now Ford has muscled in with the five-seat Tourneo Connect and the seven-seat Grand Tourneo Connect. The French aren't going to like this one bit. Ford offers a decent range of engine options in its Tourneo Connect line-up but for many, the search will begin and end with the multi-award-winning 1.0-litre EcoBoost petrol powerplant that's offered with the five-seater model. This is a cracking little engine that offers a real fizzy power delivery, its turbocharger helping the tiny three-cylinder unit to a respectable 100PS. The only potential issue here is that this version might end up feeling a little breathless if you're regularly driving with the vehicle fully loaded, in which case you might prefer a diesel variant. There are two versions of the 1.5-litre TDCi engine with a choice of 100 and 125PS power outputs. The former normally aspirated engine gets a five-speed manual box, the latter turbo unit a six-speeder and Ford's latest 'EcoBlue' technology. Go for the Grand Tourneo Connect and it's offered solely with diesel power. There's an 8-speed Powershift automatic option for those who want it. On the move, like any LCV-based product, this one handles better fully loaded, but even when there's no one in the vehicle but you, cornering is predictable. Bodyroll's well controlled too, so roundabouts can be taken at speed without the Connect rolling about alarmingly. Ford's award-winning 1.0T 100PS EcoBoost unit actually makes quite a tempting package if you won't regularly be covering long distances or carrying heavy loads and therefore don't really need the extra pulling power only a diesel engine can give. This lighter three cylinder EcoBoost powerplant also takes weight out of the front end, so the steering feels a little lighter too - though still gives you plenty of connection to what's happening under your front wheels. More than anything else, it's the Tourneo Connect's roofline that hints at its commercial vehicle origins because most of the exterior detailing is as slick as you'd expect from other Ford passenger cars. The sleeker front-end of this revised model features a five-bar Tourneo grille, combined with slimmer headlamps and a more aerodynamic lower bumper and front spoiler. The flanks don't have a whole lot of shape in them, but that's excusable given that sliding rear side doors are fitted. Whether you choose the five or seven-seater, the abiding impression is one of solidity and space, headroom most notably. Inside, this revised model features an upgraded interior with a floating, tablet-inspired 6-inch colour touchscreen on high series models, incorporating Ford's SYNC 3 communications and entertainment system. As before, every rear seat has integral head restraints and, of course, three-point seatbelts. Split 60/40, the seat backs also fold and tumble and can be removed, allowing you to maximise the cargo space. 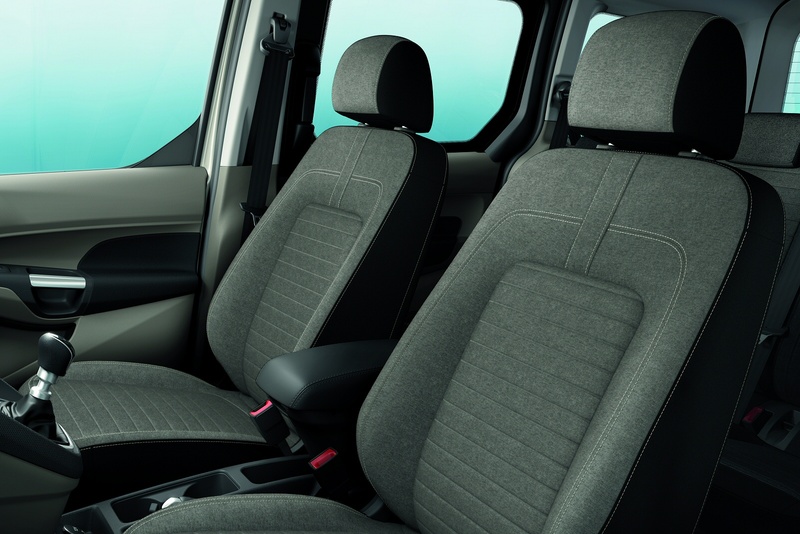 Outer second row rear seats have ISOFIX anchorage points, making it easy to fit the latest removable child seats. The Tourneo Connect has been designed to make the most of its internal space with storage boxes on both the driver and passenger sides of the dashboard, 1.5-litre holders in the front doors, floor stowage and even 'aircraft style' overhead lockers. Both the Tourneo Connect and the Grand Tourneo Connect are offered in two trim levels - Zetec and Titanium, with prices for the Tourneo Connect kicking off at just under the £20,000 mark. Should you prefer the longer car, you'll pay a premium of around £2,250 for the larger 7-seat Grand Tourneo Connect bodystyle. This makes the Tourneo Connect a little pricier than a Citroen Berlingo Multispace, but cheaper than Ford's more car-like C-MAX compact MPV, which has much less interior space. Against seven-seat rivals, the Grand Tourneo Connect also looks very competitive. Further advanced technologies include a comprehensive new range of segment-first driver assistance features including Intelligent Speed Assist that enables automatic adjustment of maximum vehicle speed to remain within legal limits, the Pre-Collision Assist with Pedestrian Detection emergency braking system, Side Wind Stabilisation, and Active Park Assist that helps to steer the vehicle into both parallel and perpendicular parking spaces. High series models also get niceties like HID headlamps and Ford's latest 'SYNC 3' infotainment system. The Tourneo Connect scores extremely well on virtually any efficiency or cost of operation metric you can throw at it. Just about the only caveat worth mentioning is that the 1.0T petrol engine probably won't make anything like its quoted 50.4mpg combined fuel economy figure if market experience of this unit in some of Ford's other models is anything to go by. This petrol variant's CO2 figure is 129g/km. If you're really concerned with economy, it'll be better to plump for one of the diesels. The 100PS TDCi powerplant gets a combined 64.2mpg and emits 115g/km when fitted with Ford's Auto-Start-Stop system. Better though, is the 125PS 1.5-litre TDCi EcoBlue diesel unit which returms about the same figures, espite its extra power. A gearshift indicator is provided to help owners get somewhere close to those returns on an everyday basis. Cleverer is the innovative Ford Eco Mode system that continually assesses the effects of your driving behaviour on your fuel consumption. The set-up analyses your speed, gear shifting, braking and anticipation levels, plus the number of short and long journeys you make. Smart software then advises you on how to improve fuel economy. What else? Well, there's the usual three year/60,000 mile warranty. If you�re looking for a new Ford Tourneo Connect 1.5 EcoBlue 120 Zetec 5dr Powershift Diesel Estate for sale, you�ve come to the right place. At Bristol Street Motors we don�t just have the best Ford Tourneo Connect 1.5 EcoBlue 120 Zetec 5dr Powershift Diesel Estate deals, we also offer friendly advice and help with all your enquiries to ensure your buying experience is a happy experience.